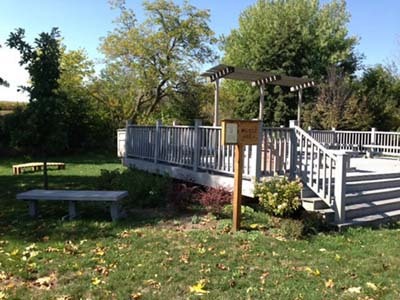 The Garden of Thanks Outdoor Classroom at Little Blessings Preschool and Kindergarten is situated on a beautiful section of land that includes a large natural area with trees, a stream, and an open space for running and play. It is the perfect location. Children are encouraged to experience the beauty and sense of peace that is found in the natural world while building on important skills through active learning. 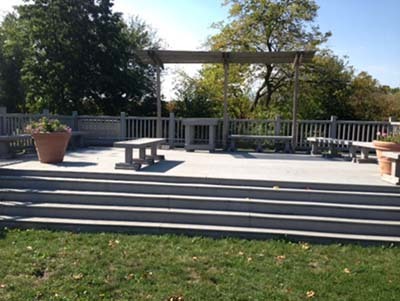 Natural elements were used in each area as much as possible. Tree cookies form the floor of the Building Area, the raised beds in the Garden Area are made from cedar, the Action Area is framed by young trees and bushes, the Nature Art Area is near a stream, to encourage observation and creativity. The Science Area is nestled in a shady spot, and has small picnic tables made from wood. At this point in the year, the Messy Materials Area has pumpkins, gourds, pine cones, and Osage Orange. All designs were kept simple and functional with special care taken while defining the spaces to keep lawn mowing a simple process. Storage units, picnic tables, the greenhouse, and the art wall have all been securely attached to the ground. 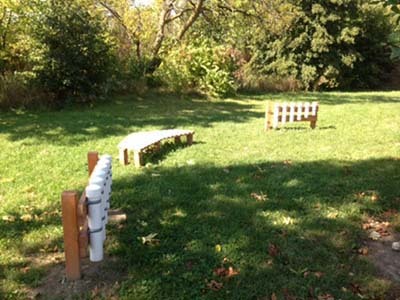 The art wall is constructed from brick, and the Music and Movement Area has very durable PVC pipe instruments and a large raised platform. The children dance and do yoga on the platform. The area was beautiful before the project began, and care was taken to preserve this beauty. 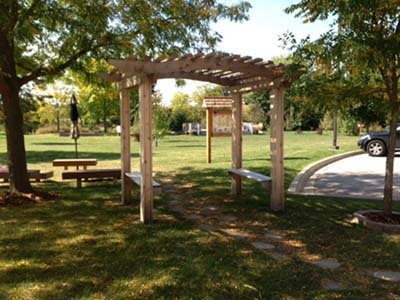 The location of each area was selected based on considerations such as sunlight (the Garden Area is in a sunny, well-drained area) the view (the Art Area is located near the stream), or what is close at hand (the Science Area is in a location where there are many rocks and fossils). 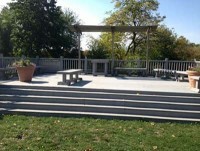 Oak, plum, apple and pear trees have been planted throughout the outdoor classroom space. The Gardening Angels, an Alleluia! 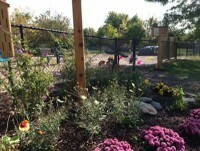 small group planted bushes and trees around the Music and Movement platform with the assistance of a local arborist. The arborist provided information on floodplain resistant plants and native prairie plants. 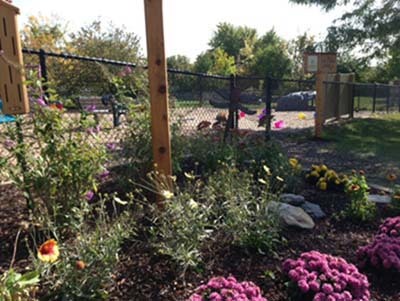 Children have planted vegetables, flowers, bulbs, and herbs in the garden beds and greenhouse, and scarecrows decorate the gardens. This fall, several steps were taken to increase awareness and involvement of the 50 staff/teachers and 400 students. 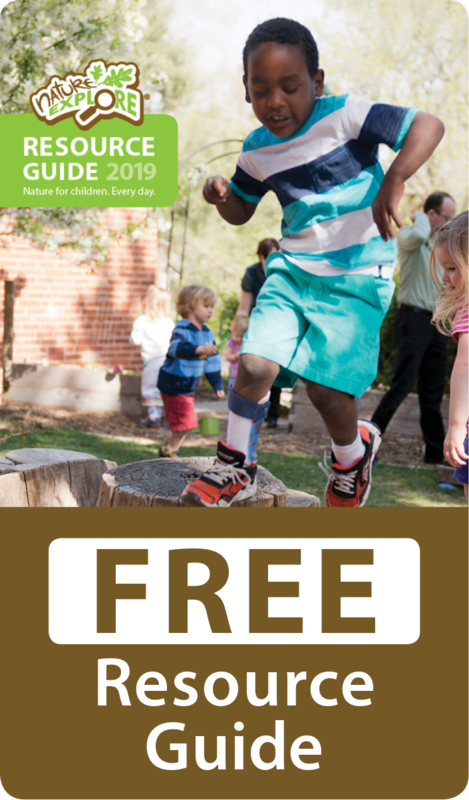 In August, staff members participated in several workshops designed to help teachers understand the importance of having children spend time outdoors connecting with nature, and providing them with specific ideas for outdoor learning. The Environmental Action Kit, found on the World Forum Foundation website, was e-mailed to all of the teachers. This kit is full of ways to inspire children’s love for the earth. There is a committee of eight teachers that meet to plan lessons and brainstorm materials that can be used in the outdoor classroom. Preschool parents and families are involved with stocking the different areas with seasonal items such as pumpkins, gourds, pinecones, bulbs, shovels, seed pods, and watering cans. Paper leaves, with items listed on them, are posted on the walls outside each of all 14 classrooms and families either gather or purchase the items on the leaf. 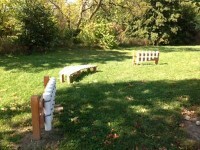 Children benefit in many ways from time spent outdoors. 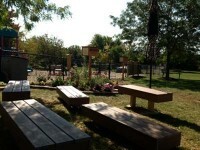 The Garden of Thanks Outdoor Classroom was developed with this simple and well-documented principle in mind. It provides opportunities that will benefit the whole child through hands-on learning, physical activity, and a means to experience the textures, beauty, and constantly changing elements of nature. 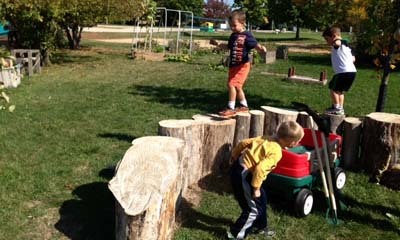 Time spent outdoors also encourages the development of a child’s imagination and sense of wonder. These attributes, when instilled at an early age, contribute to the growth of children who will become lifelong learners. In addition to attending two Nature Explore Workshops, Little Blessings teachers have viewed and discussed the DVD, “When Learning Comes Naturally” and a guest speaker presented a two-hour workshop titled, “Exploring the Natural World with Children.” Little Blessings offers programs for over 400 children of ages two through six, including Parent’s Day Out, 2-5 Day preschool, Enrichment classes, Lunch Bunch, Kindergarten and Extended Care Club. 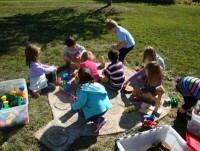 Money for the Outdoor Classroom is raised in part by parents participating in recycling using our Paper Retriever Bin.